Wanda Nazario uses layers of distorted photographs as brushstrokes to create a dialogue between painting and photography. Some of the earlier work is also painted with pastels after being printed. ​Her approach to color is influenced by her Caribbean roots, where color it is not only an expression of emotion, but a story in itself. She received a B.F.A. in Fashion Design from the Rhode Island School of Design. She worked in Italy and USA in the fashion industry for several years designing collections for fashion’s most elite houses such as Armani, Valentino, Diego Della Valle, Bottega Veneta, Moschino, Fratelli Rossetti, Ralph Lauren and others. 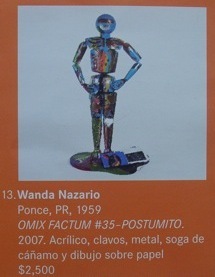 She has participated in art exhibits in Italy and in Puerto Rico. Her paintings are held in private collections both in Italy and USA. Her fashion work has also appeared in several magazines in Italy, USA and Puerto Rico.